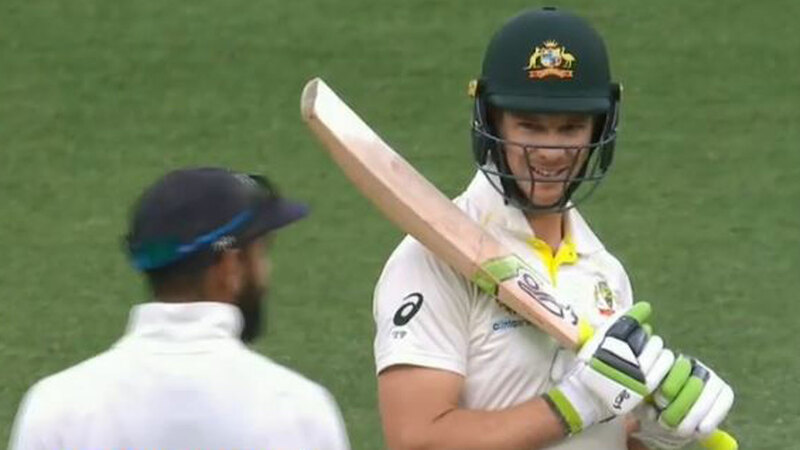 Having battled through the better part of eight days of intense Test cricket in relatively cordial fashion, captains Virat Kohli and Tim Paine clashed verbally as tensions bubbled in Perth. Kohli and teammates went up vociferously for a caught-behind appeal in the final over on day three of the second Test, desperate to dismiss Paine. It was turned down and India had no interest in reviewing but stump microphones picked up Kohli having a dig at his counterpart. "If he messes it up, it's 2-0," Kohli said, referencing the series lead he is so determined to take at Optus Stadium. Paine replied, "You've got to bat first, big head". It was a reasonably tame exchange but things appeared to become more heated at the end of play, when Australia reached 4-132 to boast a 175-run lead. Kohli and Paine continued to exchange words as they walked towards their respective dressing rooms. "Tim just asked him where he was going for dinner," Nathan Lyon laughed. "I've played enough cricket against Virat to know what he's like. "Virat Kohli is a great player. He plays on emotion. "I'm not worried about what he's doing or India's doing."